Wolves’ defender Willy Boly starts a three-match ban as a result of his sending off against Manchester City. Leander Dendoncker is expected to drop back into defence to replace Boly, with Romain Saiss coming into midfield. Leicester are boosted by the return of Jonny Evans, who has recovered from a broken toe quicker than anticipated. Ghanaian Daniel Amartey, who has a broken ankle, is the only absentee for Claude Puel’s side. This will be the third meeting between the clubs this season: Leicester won August’s reverse league fixture 2-0 and beat Wolves 3-1 on penalties at Molineux in the Carabao Cup in September. Wolves are winless in three games against the Foxes since a 2-1 home Championship victory in September 2012. Wolves recovered from trailing 3-0 at half-time to win 4-3 in their only previous Premier League home match against Leicester, in October 2003. Leicester have won one and lost five of their last eight top-flight away fixtures against Wolves. Bournemouth forward Callum Wilson faces a fitness test on the hamstring injury that has kept him out in recent weeks. Simon Francis, Adam Smith, Lewis Cook and recent signing Dominic Solanke are the Cherries’ certain absentees. Marko Arnautovic has been left out of the West Ham squad due to the ongoing saga of a potential transfer to China. Javier Hernandez is available following hamstring and back issues, while Ryan Fredericks returned to training this week after an ankle injury. Bournemouth are unbeaten in their last four encounters against West Ham, winning twice. West Ham have scored in all 12 previous meetings, amassing 25 goals in total. There have been 28 goals in the seven previous Premier League encounters – four goals per game on average. Liverpool manager Jurgen Klopp got the perfect reaction from his players, seeing them defeat Brighton 1-0 last weekend after losing their first game seven days prior. However, with City looking unstoppable at the moment, the former Dortmund and Mainz tactician will as for nothing less than three points against a Crystal Palace team that has won only one of their last four League fixtures. Klopp has not ruled out Trent Alexander-Arnold and Georginio Wijnaldum, despite both suffering knee injuries last weekend. Adam Lallana might be involved, while Joel Matip could play nearly six weeks after fracturing his collarbone. Crystal Palace goalkeeper Julian Speroni, 39, is expected to make his first appearance since December 2017. Vicente Guaita and Wayne Hennessey are out with respective calf and thigh injuries sustained against Watford. Forward Christian Benteke made his first appearance since September last weekend and is likely to be among the substitutes again. Liverpool have won five of the past six league meetings, and are vying for a fourth straight victory against Crystal Palace for the first time in the top flight. However, Palace had won three successive Premier League games at Anfield before losing on their most recent visit in August 2017. 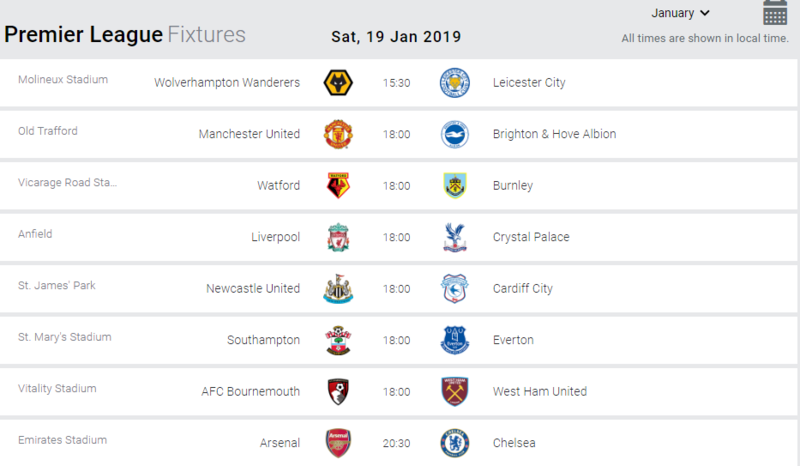 The league leaders are looking to win seven consecutive Premier League home games for the first time since January 2014. Liverpool are on a 31-match unbeaten league run at Anfield since losing to Crystal Palace in April 2017. It’s their joint longest top-flight streak since a club record 63 home games without defeat between February 1978 and December 1980. The Reds have kept 12 clean sheets in their last 16 Premier League home fixtures, conceding once in each of the other four games. Jürgen Klopp’s side have the second best defensive record of all time after 22 matches of an English top-flight season, conceding just 10 goals. Chelsea conceded eight in 2004-05. However, Liverpool have lost 11 of their 27 competitive matches in January under Klopp (W9, D7, L11). United manager Ole Gunnar Solskjær will be hoping to continue his fine start to life as the club’s manager. The Norwegian has master-mined 5 consecutive victories so far, and he will relish the prospect of a 6th with Brighton visiting Old Trafford on Saturday. Alexis Sanchez is expected to be fit to face Brighton following a minor injury. Eric Bailly is available after suspension but Marouane Fellaini has a calf injury and joins Chris Smalling and Marcos Rojo on the sidelines. United have never lost at home to Brighton (W8, D2) and have won the last four meetings at Old Trafford without conceding. However, the Seagulls have won the two most recent encounters: 1-0 and 3-2 home triumphs in May and August last year. Brighton could become the first team to win three consecutive league games against Manchester United since Swansea in 2014-15. Ole Gunnar Solskjær could equal the longest Premier League winning streak by a manager from the beginning of his reign at a club: six by Carlo Ancelotti for Chelsea in 2009 and Pep Guardiola for Manchester City in 2016. United could score three goals or more in in four consecutive home league games for the first time since September 2011. They have kept consecutive clean sheets, as many as they managed in the first 20 league games this season. Newcastle will assess the fitness of Ciaran Clark and Jamaal Lascelles, who were both substituted with injuries during the FA Cup win at Blackburn. Fabian Schar and Isaac Hayden were also hurt in that tie but should be fit, along with Kenedy and Mo Diame. Paul Dummett and Jonjo Shelvey remain out. Cardiff will give a debut to Oumar Niasse, signed on loan from Everton. Captain Sean Morrison is expected to miss out after having what the club only described as “a procedure”. The goalless draw in August’s reverse fixture ended Newcastle’s 10-match winning streak against Cardiff in the league. Cardiff have lost 17 of their last 18 away league games against Newcastle, including nine in a row since a 4-0 victory in November 1963. However, Cardiff did win an FA Cup tie against Newcastle at St James’ Park five years ago. Newcastle have won their last seven top-flight home meetings in this fixture by an aggregate score of 23-0. Southampton welcome back the trio of Pierre-Emile Hojbjerg, Yan Valery and Charlie Austin, who are all available having completed suspensions. Danny Ings is back in training after a thigh injury but Ryan Bertrand, Shane Long and Mario Lemina are doubts, and Michael Obafemi remains out. Everton winger Ademola Lookman is set to make consecutive Premier League starts for the first time this season. Phil Jagielka is sidelined because of an injury sustained during training. Everton have won only three of their 19 Premier League fixtures at Southampton, drawing six and losing 10. The Toffees can do the league double over Southampton for the first time since 2001-02, having won 2-1 at Goodison Park in August. Watford are expected to be without midfielder Will Hughes, who sustained a suspected concussion in the win over Crystal Palace last weekend. Andre Gray and Christian Kabasele have returned to training and could feature. Burnley trio Johann Berg Gudmundsson, Matt Lowton and Phil Bardsley are fitness doubts but Steven Defour and Stephen Ward are both back in contention after injuries. Robbie Brady serves the final game of a three-match suspension. Watford are aiming do the league double over Burnley for the first time since 2002-03 in the second tier, having won the reverse fixture 3-1 at Turf Moor. Burnley can win back-to-back league fixtures at Vicarage Road for the first time in 17 years. None of the previous 19 league meetings have ended goalless. The biggest fixture in the Premier League this weekend pits two London sides fighting for the same cause. Despite a brilliant start to the season, Chelsea have now settled for fighting for top four, which is also Arsenal’s primary target. The two played out a thrilling 5 goal game the first time they met this season with Chelsea winning it 3-2 at Samford Bridge. The game on Saturday give chance to Arsenal to prove they are still in the fight and getting one over their rivals may surely reignite their season. Hector Bellerin and Nacho Monreal could return to Arsenal’s starting line-up, having been named on the bench last weekend after recovering from injuries. Mesut Ozil will hope for a recall after being left out at West Ham, but Henrikh Mkhitaryan remains absent, though he is nearing a return from a foot problem. Chelsea may again deploy top scorer Eden Hazard as a false nine. Alvaro Morata is available but is unlikely to start as he continues to be linked with a move away from the club. Fellow striker Olivier Giroud is nursing a swollen ankle but says he is fit to play, while Ruben Loftus-Cheek is out with a back problem. Chelsea’s only defeat in their past 14 league games against Arsenal was a 3-0 loss at the Emirates Stadium in September 2016 (W8, D5). The Blues can become the first visiting team to win six competitive fixtures at the Emirates. They are currently level with Manchester United on five victories. Premier League games between Arsenal and Chelsea have produced 13 red cards, more than any other London derby. However, they are the only clubs yet to have a player dismissed in the top flight this season. Arsenal have lost four of their last eight games in all competitions, having been unbeaten in their previous 22 matches. The Gunners are undefeated in their last 10 Premier League home games (W8, D2), with their last loss coming against Manchester City on the opening weekend of the season. They are unbeaten in their previous 12 Premier League London derbies at home, winning the last five. Their most recent home derby defeat came against Chelsea in January 2016. Arsenal have kept just three Premier League clean sheets this term – only Fulham, with two, have a worse record. Chelsea scored 27 times in their opening 11 league matches this season (2.5 per game) but have netted just 13 times in their subsequent 11 outings (1.2 per game). They have not scored more than twice in any of their last 11 top-flight matches. Chelsea are looking to win four consecutive Premier League away games within the same season for the first time since a six-match sequence from October to December 2016. They have won just one of their last nine league games away to the established top six (D3, L5). That solitary win came at Wembley against Tottenham in August 2017. Man City continue their fine run of form, winning all their last four competitive fixtures (3 in the League). They currently look like the side that tore apart everyone in the League last season and bottom placed Huddersfield will clearly be worried going into the encounter. Mark Hudson will select his first Huddersfield line-up since being named as caretaker head coach. Captain Tommy Smith could return from a hamstring injury after being an unused substitute in the draw against Cardiff. Manchester City captain Vincent Kompany is a doubt with a muscle problem but manager Pep Guardiola has no other fresh injury problems. Left-back Benjamin Mendy, who has had a knee injury since November, is nearing a return but is not yet ready. Huddersfield were thumped 6-1 by Manchester City in the reverse fixture earlier this season. City’s 10-1 win when the teams met in the old Second Division in 1987 remains a record league win for them, and a record league defeat for Huddersfield. Manchester City’s three domestic defeats this season have all come in their last seven league games – but they have won their last three matches, and their last five in all competitions. City have conceded just seven goals away from home in this season’s Premier League; no team has let in fewer. They have scored 99 goals in all competitions this season, more than any other club in Europe’s top five leagues prior to the weekend. Manchester City have scored 19 goals in their last three games in all competitions – that’s one more than Huddersfield have managed in their last 36 matches in all competitions. The only goal Manchester City have conceded in 2019 came against Liverpool. Since then, City have played 296 minutes, scoring 20 goals without reply. New signing Ryan Babel could make his Fulham debut after signing from Besiktas earlier this week. Defender Alfie Mawson remains a long-term absentee with a knee injury. Tottenham’s Moussa Sissoko has been ruled out with a groin problem, but Eric Dier, who has not played since early December due to appendicitis, could be involved. Harry Kane is out with an ankle injury and fellow forward Son Heung-min remains absent on international duty. With Lucas Moura not yet ready to return from a knee injury that could mean Fernando Llorente starts up front. Tottenham have won the four most recent meetings in all competitions. Fulham have failed to score more than once in any of their last 12 Premier League matches against Spurs. This is the 50th top-flight fixture between Fulham and Tottenham Hotspur. Spurs have 28 wins to Fulham’s eight, with 13 draws. Spurs have won six of their past eight league matches, but have lost two of the last three. Tottenham have the best away record in the Premier League, with 10 wins from 12 matches. Victory against Fulham would put Tottenham on 51 points after 23 matches, which is one game fewer than they have ever taken to reach a half-century of points in the Premier League. Spurs are the only team in the top four divisions of English football not to have drawn a league match this season. They could fail to score in consecutive Premier League fixtures for the first time since May 2015. Tottenham have lost three of their four league games played on a Sunday this season, winning the other.